The smell of copal, a sacred incense used in rituals, celebrations and offerings, filled the air as the Fresno American Indian Veterans Association Color Guard blessed the land where the annual Sophía García-Robles Memorial Drum Feast is held. The annual event occurred at the Family Student Housing Field on April 21. Seven years ago, Drum Feast was created to honor Sophía García-Robles, an indigenous woman and faculty member at UC Santa Cruz. During her time at UCSC, she served as a financial aid adviser, mentor and advocate for many students, especially in the Chicanx/Latinx and American Indian communities. This advocacy is especially important in the fight for representation because, currently American Indian students account for less than 2 percent of the undergraduate population at UCSC. People of the Islands (POI) is a student-run dance group on campus that performed a cultural dance. Coordinated by the American Indian Resource Center (AIRC), Drum Feast works to honor and bring visibility to American Indian culture and other indigenous cultures of the Americas. The event centered on the music, art and dance of indigenous cultures. “It’s most important to us that people know that American Indians are still living, and that there’s American Indian students on campus, and that we’re still celebrating our community and our culture today,” said AIRC director Rebecca Rosser. Students and community members showcased traditional dance and song from several indigenous cultures, including Pacific Islander and native Mexican peoples. American Indian performers, such as the Fremont Drum Group, included young people from a variety of different tribes. Other performances at Drum Feast included the People of the Islands (POI), Grupo Folklorico Los Mejicas de UCSC, Senderos and the White Hawk Aztec Dancers. 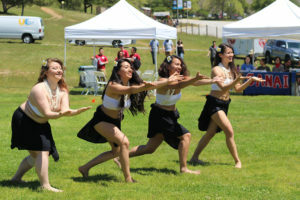 POI, a Polynesian UCSC student-run dance group, opened the celebration. Their performance emphasized the significance of cultural meaning. The White Hawk Aztec Dancers were one of the last performances of the event, demonstrating cultural practices and significance. Native community members attended the event to showcase different aspects of their culture. Tables at Drum Feast included the Sahvúrum Collective, a group of friends from the Hoopa Valley Tribe in Orleans, California. The collective sold handmade traditional jewelry. The AIRC also sold a variety of handmade tamales while community members sold freshly-made fry bread topped with strawberries and honey. One of the final performances was by the Fremont Drum Group, a community-led drum circle. The group consists of Native American students grades K-12 who are dedicated to learning songs, drum protocol and traditions. It is also a safe and educational space for Native youth to find solidarity with one another through education and culture, something especially necessary during the current political climate, expressed drum keeper Christina Cruz. “[Gathering Drum] is a way that our children in an urban area are able to connect with their Native roots in a supportive way with other Native youth who are understanding and inclusive,” Cruz said. 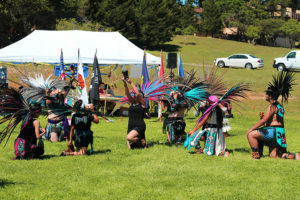 Volunteers and participants at the event expressed the need to bring more recognition to indigenous cultures, as well as visibility to the Native American students at UCSC.